The pet store Petland is notorious for selling puppy mill puppies. The Humane Society of the United States has done several reports and exposés on the chain store, animal welfare websites everywhere are warning people to stay away, yet still the public seems to be blissfully unaware of the truth. In Des Moines, a few years back, a local news station exposed the local Petland and the puppy mills that they got their puppies from. That attention paired with the protests held by a group of animal lovers caused the store to go out of business- which is great news for the puppies. Now fast forward about six years… We have the same problem but in a different Iowa town. The Petland in Iowa City has been selling puppy mill puppies and lying about it to the community for far too long. College students come in, fall in love and then get a credit card to buy that $1600 dog that they have always wanted, not realizing that they are giving money to a very cruel, very real industry. And this time, the local news station is right in bed with Petland, as opposed to being a voice for the real victims, the dogs. It has come to our attention recently that KGAN CBS 2 has a segment on their show called, “Creature Feature” where you can “Ask the Expert” from Petland about your pet needs. Several animal advocates reached out to KGAN on several occasions about what they are supporting when they give this pet store air time- but the concerns went unanswered. Instead of doing their own research into where Petland gets their puppies, THEY ASKED THE MANAGER. “Our breeders are USDA licensed” and “Our puppies are healthy- they come with a health guarantee” are two common claims made by pet stores, specifically Petland on their Facebook page. As the HSUS shared in this article, the pet stores do not have to tell the truth. It is a money game, and they will do whatever they can to protect it. Here is the same form letter response that every person got in regards to their concerns about KGAN and their connection to Petland. After receiving this response, several of us pleaded with them to do their research and look into Petland, but we were shut down. So, we took it upon ourselves to do the investigative work that KGAN should have done before they chose to partner with one of the biggest chain stores that exploits tens of thousands of puppy mill dogs a year. So, thanks to an employee that was a little too helpful, the USDA website and a few other searches that concerned citizens have done, HERE are just a few of the breeders that Petland in Iowa City uses. 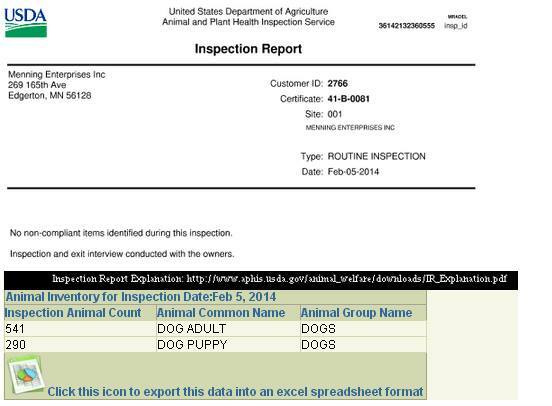 The latest USDA inspection report from January 2014 shows that there are currently 24 adult dogs and 14 puppies on their property– which doesn’t sound large at all. When people think of “puppy mill” they think HUGE breeder. Since we haven’t personally seen this property, we can only go based on the information that the USDA gives. In this case, it shows that the Swiharts had medication in their fridge that was expired. One was a year and the other was two years expired! We can only speculate that these were used on the dogs. They were also written up for having old and frozen feces in the cages. Pictured below is a screenshot of their latest USDA inspection report. For good measure, I went ahead and pulled the inspection report before this. At that point in time, they were cited for having cages that were chewed up, worn down and not impervious to moisture. At this point in time, they had 40 adult dogs on their property. These puppies travel almost four hours just to get to Petland’s cages. Mike and Tricia Jouwstra, Jouwstra Kennels. Edgerton, Minnesota. This is another name that the Petland employee gave out as one of the breeders that the store uses. Mike Jouwstra from Edgerton, Minnesota. Sadly, this breeder really fits the definition of puppy mill- lots of dogs, sick dogs, cages too small, feces in cages, and feces in the food bowls. But Petland stands by their claim that their breeders are USDA licensed and inspected. Again, the inspection reports are below. Please read them for yourself. Again, for good measure. The reports before this one (a year before) show no violations, but even more dogs. The puppies travel over 5 hours to get to Petland. Here is some extra information that we found. Both Mike and Tricia have been fined and suspended from the AKC for ten years. That was up in 2009. This is the last name we were given by the employee, and it has the most dogs on the property so far. The latest USDA report of Menning Enterprises shows over 541 adult dogs and almost 300 puppies on the property. These animals never leave their cages, they receive little to no vet care and they are bred until their bodies give out. Read here about Captain’s story, a young puppy who was born at Menning’s. 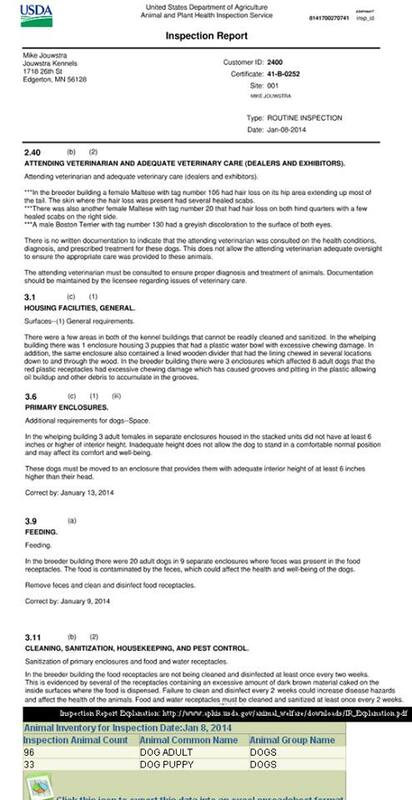 Here is a report from PetShopPuppies that shows all of the puppies that came into Menning’s because he is also a broker. 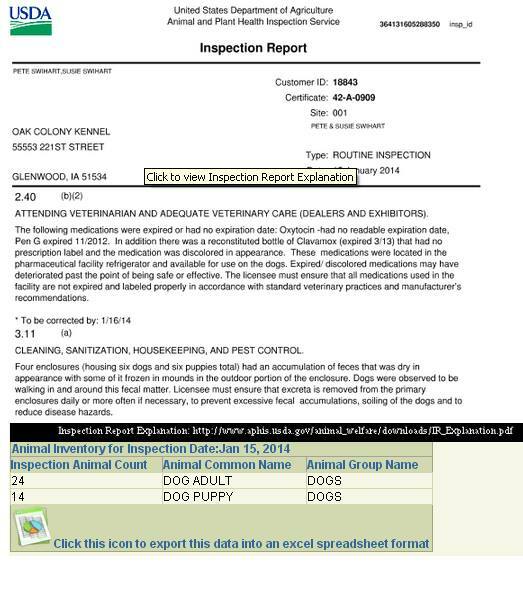 Some puppies were very ill. At the end of the report, you can see that Menning was cited for selling 137 underage puppies in one year. Before that another 97 puppies were sold that were too young. Per AWA standards (the laws that protect the dogs in commercial kennels) the puppies must be at least 8 weeks old before they travel. Many puppies in pet stores like Petland, are barely 8 weeks old- if that. Again, the puppies travel over 5 hours just to get to the pet store. As it was stated above, the information on the breeders listed so far was given from one of the Petland employees. All we had to do was ask… Something that the news station couldn’t bother themselves with doing, which is very depressing. 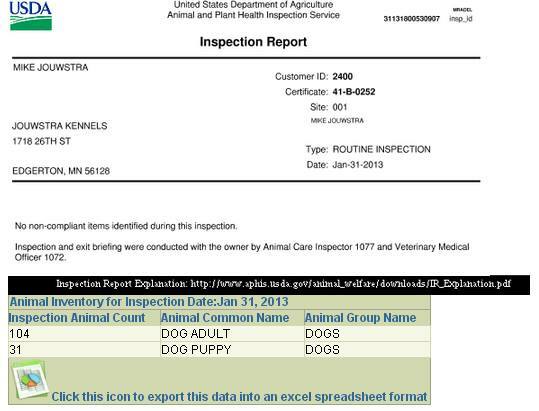 According to the HSUS, the Iowa City Petland also uses (or used) Top Notch Kennels, they had over 250 adult dogs on their latest inspection report (2012). This link shows other breeders that have been connected to Petland as well, it also shows instances where puppies sold were sick. Several of the breeders have shown up on the ASPCA’s database on puppy mills and the pet stores they sell to. Here is an easy link to see other Iowa puppy mills that sell to pet stores all over the country. As you can see from the proof above, Petland does sell from LARGE SCALE USDA breeders, and they are clearly puppy mills. There are reputable breeders out there, and they would never sell through a third party. Reputable breeders want to know where their puppies are going, they require an application and they want the animals back if you can’t keep them for whatever reason. They do not finance dogs, they don’t keep enough puppies on-hand to keep the cages full and they certainly do not sell to any stranger with a credit card. The mark up on these puppies is high also. They buy each puppy for around $50 (depending on the broker or breeder) and sell for over $1000- which is why they can have sales like these. After 2 years of protesting the Petland in Iowa City, we are starting to hear from former employees. I sincerely hope that this article opens a few eyes about the horrors of puppy mills and their connection to Petland. Please remember, the pet store has EVERY reason to lie. They are the ones making an insane profit off of these puppies. If you are outraged and live in the Iowa City area, please contact us! And to read more from one of the former employees, please click here. And please, visit our Facebook page and don’t forget to like it! I’ve posted to every social network that I’m connected to. Thank you Mindi! !